View More In Woodworking Project Plans & Kits. The 1" electronic Wingman1 filter- utilizes the latest technology, with superior design and efficiency, enabling it to capture over 97% of airborne particles .25 micron and larger- including Pollen, Household Dust, Bacteria, Pet Dander and Smoke that can trigger allergic reactions. The Wingman1 filter incorporates a powerhead which is powered by an adapter that can be plugged into a standard outlet. The adapter is similar to a cell phone charger. When the charge created by the power head is applied to the center screen it creates an electrical field, which causes the respirable sub-micron particles to adhere to the filter pads like a powerful MAGNET. If your heating or cooling system uses a single one-inch thick throwaway type of pleated or fiberglass filter, simply slide the Wingman1 air filter into the old filter slot. Plug the 24-volt AC adapter into a nearby electrical receptacle and take control of your home's indoor air quality! Also, a perfect replacement for an existing air cleaner: Clean Air Defense AirRanger , Nature's Home One Hour Xenon MicroPower Guard Diamond Air Cleaner , Dynamic Air Cleaner and more at a fraction the price! Turn your HVAC system into a whole home air purification system by replacing your 16x24x1 disposable filter with the high efficiency electronic Wingman1. Captures over 97% of airborne particles .25 micron and larger- including Pollen, Household Dust, Bacteria, Pet Dander and Smoke that can trigger ALLERGY symptoms or asthma outbreaks. Take control of your home's indoor air quality this year with the high efficiency Wingman1 and breathe clean air! 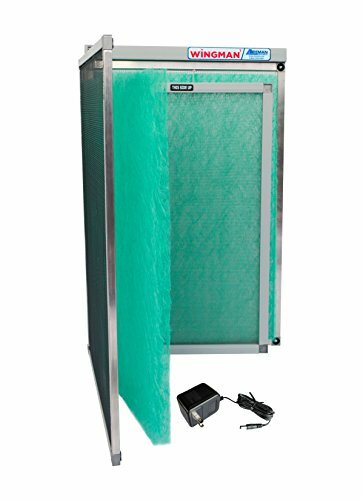 Quick & Easy Installation: Homeowner Installed (NO Tools Necessary)- Simply replace your current 16x24x1 disposable filter with the high efficiency Wingman1 electronic filter and plug it in! Protect Your Equipment: Pleated filters can restrict air flow and damage your HVAC equipment. The Wingman1 allows increased airflow resulting in less equipment runtimes, maintenance and wear. Enjoy faster home cooling or heating, improved air quality and lower utility bills with the Wingman1 Electronic Air Filter. If you have any questions about this product by WINGMAN1, contact us by completing and submitting the form below. If you are looking for a specif part number, please include it with your message.